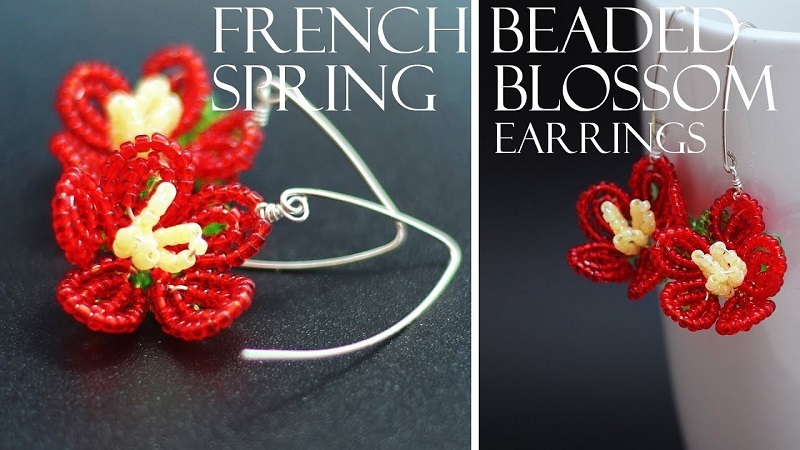 French beaded flowers are usually associated with much larger designs for home decor or bouquets. But Fen Li of Bead Flora Studio has a dainty French beaded flower earrings tutorial which clearly shows you can make small designs as well. This technique is easy. You do need to string on a lot of beads so using a bead stringing tool is very helpful. Fen uses one! I do like her continuous beading technique which reduces the number of wire ends down to just 2. This does not matter if you are making a large floral arrangement. However, you do need to minimize the wire bulk for earrings. Using wire means the petals can be manipulated so the flower has a 3D appearance. This is something that is much harder to achieve with beadweaving.